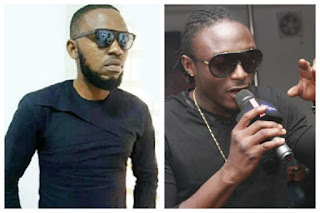 Nigerian musical artist, Ay.com has revealed that he has settled his differences with co-artist Terry G.
Many years ago, singer, AY.com, used to be one of the raves in the industry, he and a close friend in the industry, Terry G had a high profile dispute back then. “I have been working and putting things together. I would be launching my band, AY.com and the AJ Band very soon. We’ve actually been working behind the scenes and it’s about me enlarging my coast. “I don’t have to try to meet up with Wizkid and Davido. On the other hand, they are the ones that should keep up with me. “I wrote Pass Me Your Love and I can still write something better. Tomorrow is supposed to be better than yesterday; I still have a lot of great things for my fans. Just keep your fingers crossed and watch out for the new things I’m bringing to the table.